Rachel & David are from Melbourne, Australia. 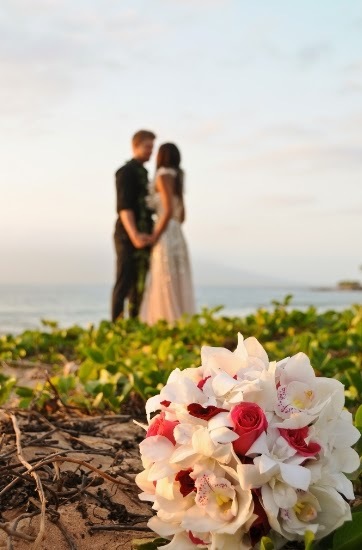 Although they've only been together for two years, they knew it was time to tie the knot, and what better place to do that than on the beach in Maui? They chose Wailea Beach for their ceremony, right in front of the Four Seasons Resort. They selected the easy-going attitude of seasoned minister Rev. James "Kimo" Kirkman, who performed his Hawaiian style ceremony. Although they didn't have guests, as they put it, "we didn't want to invite them to join us on our honeymoon", there were plenty of beachgoers that cheered them on after the ceremony. Rachael found a coupon code on the Maui Weddings section of our website, which gave her a free bridal bouquet. 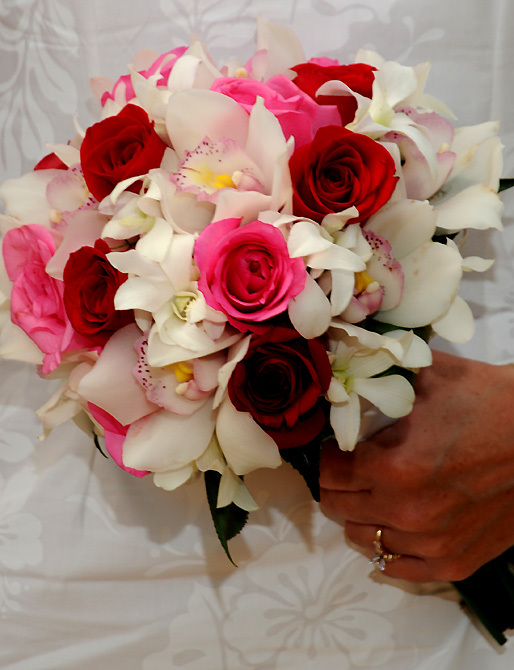 She choose a style from the bouquet gallery on the Hawaiian Island Weddings website that was named B108 with roses, white orchids and cymbidium orchids in a clutch style. It was the perfect touch of color for their ceremony. After the fantastic sunset and photos, the couple went back to their hotel, the Wailea Marriott Beach Resort, and had dinner at the Mala Restaurant, signature restaurant of the resort. A perfect ending to a perfect wedding day!